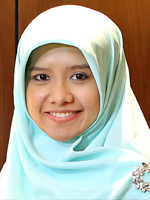 Thanti Octavianti is a doctoral researcher in geography and the environment at the University of Oxford. She investigates the political dynamics arising from a policy to pursue large-scale infrastructure to enhance urban water security, using a seawall megaproject in Jakarta, Indonesia as a case study. She holds MSc in Water Science, Policy and Management from Oxford University and BEng in environmental engineering from Universitas Indonesia. Prior coming to Oxford, she worked as a consultant in the Ministry of Public Works, Indonesia assessing the local governments' performance in the provision of water services. 2018, Workshop grant from the British Council Researcher Links to participate in ‘The potential of groundwater in Malaysia's resilient urban future' workshop in Putrajaya, Malaysia. Octavianti, T. (2017) Ist Jakartas Deich-Megaprojekt die Lösung für das Absinken der Stadt? Südostasien, 33(4): 35-36. December 2017. "Jakarta's lock-in infrastructural approach". Paper presentation in the International Young Water Professionals Conference. Cape town, South Africa. August 2017. "The politics of ideas behind a seawall project in Jakarta, Indonesia". Paper presentation in the EUROSEAS Conference, Oxford. May 2017. "Jakarta's seawall project: An unconscious bias?" Paper presentation in the Southeast Asia Seminar in St Anthony's College, Oxford. April 2016. "Historical pathways of water security evolution in Jakarta 1600s-2000s". Paper presentation in the 5th Southeast Asian Studies Symposium, Oxford.